Coming to us Live from LOFT 22, we are proud to bring you, The Singleton Discovery Series in association with The Singleton Of Glen Ord Whisky and Lan Kwai Fong Group. Winner of the 2014 International Blues Challenge and Gibson Best Guitarist Award. Steeped in Gospel roots, Mr Sipp has transitioned into a powerful and emotional exponent of traditional electric Mississippi blues. This is the real thing! Castro Coleman a-k-a Mr. Sipp "The Mississippi Blues Child", began playing the guitar at the tender age of 6. 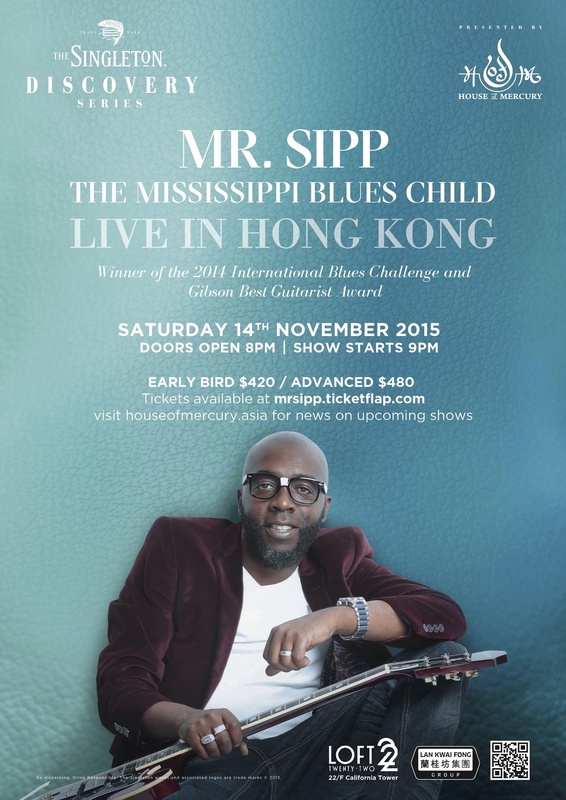 Due to hard work and perseverance, Mr. Sipp has become an awesome vocalist, songwriter, musician, composer, producer and entertainer. Castro has over 125 credits and has played on over 50 national recordings with several Grammy nominated projects. He has traveled to Russia, Germany and other countries spreading his gift of music. Mr. Sipp was also cast in the recently released James Brown movie, "Get on Up". Check out this heart stopping performance here. We are in for a treat! Stay tuned to House of Mercury for news on upcoming shows.